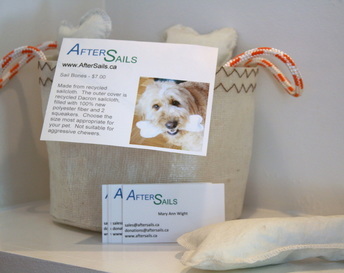 AfterSails is a home-based business located in Ottawa, Ontario. All our products are individually hand-crafted from recycled sails and other sailing materials, lines, and hardware. Our aim is to recycle as much of the sails as is possible to keep them from landfills, while at the same time creating attractive, durable and useful products. Note: All products (with the possible exception of Sail Bones and wreaths) are machine washable and water resistant. Order Now - ​Secure online ordering is available through Square at https://squareup.com/store/AfterSails/ or click on the STORE link above. NOTE: The individual items pictured below have been sold. All online orders are made-to-order. We also accept custom orders for products not shown on our website made to your requirements and specifications. Contact sales@aftersails.ca for details. New product coming soon: Aprons. Shown at our last two craft shows were our new sailcloth aprons, with a custom design of either an anchor or a lobster made of sail insignia material. These aprons sell for $35. each plus shipping and can be custom ordered now. Other insignia designs are available, please inquire. ​Tote Bags - the standard tote bag is made from Dacron or laminate sailcloth (depending on availability). There is an inside and an outside pocket. While the bags are predominantly white, stripes, numbers, and other insignia may be incorporated into the design based on the original sail markings. Each bag is lined with either lighter weight nylon spinnaker material or with heavier weight dacron or laminate sail cloth. Duffel Bags - A traditional round duffel bag with two handles and a zippered top. Made with either Dacron or laminate sailcloth (depending on availability). There is one outside pocket and the handles are made from either recycled lines or sewn sailcloth. There are two sizes. The large duffel is approximately 55 cm long x 31 cm diameter and is priced at $55. It's an ideal size for taking your life jacket, gloves, boat shoes, etc. with you to go sailing after work. The small duffel is approximately 45 cm long x 26 cm diameter and costs $45. It will hold everything you need to go to the gym. ​Bucket Totes - unlined round bags with a series of various sized pockets on both the inside and the outside. Some designs use Mylar or other laminates for the pockets. These bags have reinforced bottoms and are ideal for multiple uses such as tool bags or to hold your toiletries and towels when visiting a marina's facilities. Approximately 33 cm high x 28 cm diameter - Price $45. ​Sling Bags - Another new design that can be carried over your shoulder or as a backpack. Each bag has a rope handle that can be cinched closed as well as an inside zippered pocket. ​Approximately 47 cm high x 24 cm diameter - Price $35. 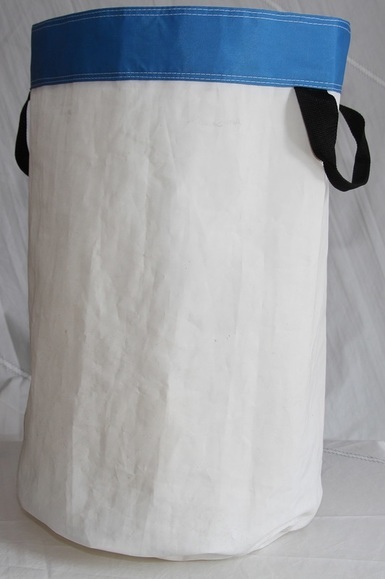 ​Laundry Bag - This is a limited edition bag made from extra heavy duty Dacron that can freely stand on its own. Two web handles make it easy to carry. ​Approximately 60 cm high x 37 cm diameter - Price $55. 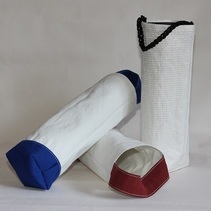 ​Wine Totes - a four bottle carrier for wine, rum and cola, or your choice of beverage. Price $35. ​Chart Weights - similar to a bean bag but filled with 30 gm of dust free aquarium grade gravel. Sold as a set of four in a storage bag. Ideal for holding a chart flat on your table to prevent it from rolling back up. Price $15. ​Sail Bones - made from recycled sailcloth. The outer cover is recycled Dacron sailcloth, filled with 100% new polyester fiber and 2 squeakers. Choose the size most appropriate for your pet - small, medium, or large. Not suitable for aggressive chewers. Price $7. ​Gift Bags - A single wine bottle tote or gift bag. Approximately 34 cm high x 10 cm wide x 10 cm deep - Price $15. ​Kit Bags - A shaving/cosmetics bag with a sailcloth or Sunbrella exterior and lined with sailcloth. As with most AfterSails products, these are machine washable and water resistant. Approximately 14 cm high x 23 cm wide x 13 cm deep - Price $12. ​Pouch - A small zippered pouch suitable for holding small items in a purse or tote. Made from sailcloth and/or Sunbrella. Machine washable and water resistant. Approximately 17 cm high x 20 cm wide - Price $7. ​Custom Orders - Custom orders are accepted subject to availability of time and materials. 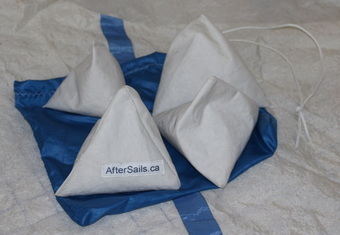 Quotes for custom orders can be made upon request to sales@aftersails.ca. If a quote is accepted, a non-refundable deposit of 50% must be made before the work is started. ​We now have some larger sails in stock suitable for making shower curtains or other large items. Inquire for details.